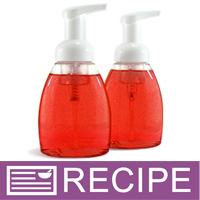 Spruce up your bathroom around the holidays with this red cranberry scented foaming hand soap. This project uses a foaming hand wash base, which makes this project very easy. Frosted Cranberry Fragrance Oil adds the delicious smell of cranberries with a hint of velvet plum. Perfect around Christmas! 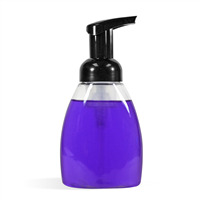 The foamer pump top allows users to fill their hands with creamy and foamy hand wash. Be sure not to overfill these bottles as drowning the foamer mechanism can inhibit the product to foam. You Save $23.05 by purchasing this kit rather than buying the items separately. COMMENTS: I purchased this kit and it WAS quick and easy to make. I made it a couple of weeks before I was going to place it in our retail store but within a week, the bottom portion of the mixture was a milky color. The separation disappears when you shake it but I can't sell this product like it is. "Such a great starter Kit"
COMMENTS: A nice quality product. Quick, simple and attractive product to make for your own use or to test in your market area. Takes only minutes to mix and pour into the provided bottles. Slap your own label on these and you are ready to sell! I did make several scents of my own with the one kit I purchased. You don't have to use just the scent it comes with! Change it up and use your own fragrances you have on hand too. "I am looking to make a hand soap that is antibacterial. Is this one?" Staff Answer The Creamy Hand & Body Wash base is not antibacterial. "I bought and made this kit to give as Christmas gifts. The soap in the bottles has separated and looks dreadful. What can I do to fix this? I am so disappointed! :-("
Staff Answer This recipe states the fragrance needs extra modifier. If you added the modifier at a 5:1 ratio and it is still separating, you may need to add additional modifier to each bottle to help it stay modified. I did add the modifier as suggested in the recipe and it did separate. How much more per bottle would you recommend? Staff Answer You will just have to add a small amount at a time until it mixes. Unfortunately, we cannot give you an exact amount. Do I need to heat the soap solution before I add more of the modifier?